The Vancouver Sun Saturday, February 28, 2009. VANCOUVER, B.C. – Metro Vancouver's real estate markets turned in 2008, which has meant falling sales and declining prices since late last spring. Now, with gloomy economic developments dominating the news, uncertainty reigns over what is going to happen in real estate markets and when a recovery might be expected. The Vancouver Sun wanted to take a longer-term view. The Sun invited to its editorial offices a panel of experts in Polygon Homes chairman Michael Audain, top realtor Patsy Hui with Re/Max Westcoast, and Tsur Somerville, director of the centre for urban economics and real estate at the Sauder School of Business at the University of British Columbia. The conclusion of their discussion: The economic turmoil will continue having an impact on markets, and prices will keep declining. But at some point they will have to “unfreeze.” Sales will pick up as people have to buy and sell property for family reasons. In the longer run, that normal activity, coupled with Metro Vancouver’s attractiveness as a destination for immigrants, give the region a solid basis for real estate markets to grow back from. Question: On prices, do you think they will stabilize any time soon, have you seen any signs of that? Michael Audain: I think Patsy knows a lot more about it than I do, she's closer too it every day whereas I tend to look at the reports from our sales offices and talk to my colleagues in the industry. I think the first thing to deal with is volume. The volume of sales was as low as I can remember it in about 27 years for October, November, December and January. The market was almost frozen. But we've noted in February the volume does seem to be picking up, particularly in the city of Vancouver and Richmond. That's usually where, in the past, it has picked up first and tends to spread. So, I expect the volume to increase, the volume of sales, as the spring goes on.... You can't have frozen markets for very long, because eventually some people have to buy or sell. New families are being formed, families are splitting up, people are coming to town, people are leaving town and they have urgent reasons to make a transaction. So the volumes will pick up over the course of the year, I do believe that. Q: As a result, do you think prices will stabilize? MA: I think the price stabilization comes later. You have to have volume for a while, and to get volume also, people need to get their prices down to a level that the consumer thinks that they're a bit of a bargain. Because the home buyer right now is somewhat apprehensive. There is a lack of confidence in the market and a belief that prices will continue to fall. So prices have come down, and in they may have, in some areas, some way to go. In terms of when prices will stabilize, I think it is quite likely that by the third-quarter of this year we'll see general price stabilization, if all things hold equal. Of course they don't. But I'm fairly confident, based on other market corrections I've lived through and traded through in the Greater Vancouver area, by the third-quarter we'll see price stabilization, if not price increases. In our own cases, we are, in some areas, starting to increase prices again after we got significant volume of sales and started new projects and we're starting to inch prices up. Q: [To Patsy Hui] From your vantage point, what do you see? I don't think anybody in this world, and I'm talking about the world this time because it's a worldwide thing, can really tell you what's going to happen and when it's going to stabilize. I'd like to tell buyers that it's already doing so, but I honestly always tell my clients to purchase, there's two criteria: first, you can afford the payments for the next five years, and also that you love the place. Because it doesn't matter whether you bought it right here at the height of the market ? crash in two years. Yet again, if you stay put, just trade up, trade down, stay in the home, 25 years later it's your retirement income. If you wait, say a year or two, with headlines like this [holds up photocopy of Sun headline] that you guys did...., who's going to buy? This instills fear in people. But if we don't have things like this ... we actually encourage this is a great time to buy. Two days ago, Global did a segment that there's a buying frenzy. I love it. And Ming Pao, Feb. 11, it's like a mini spring fever in the housing market. I love it, I carry it with me all the time showing clients that 'look, it's a great time to buy', and it is. Interest rates this morning, I got a client telling me he got 2.4 per cent. When I came to Canada, it was three per cent. Why wouldn't you buy? Why wouldn't you want to live in your own place and pay your own mortgage. And the earlier you buy, the earlier you retire from your mortgage days. I can't see any better time than now, and I can feel it, because it was in the news. The number of sales per day versus the first part of February … increased from 30 to 68. Do you really want to wait until the price start going up? Because honestly, I'm with clients every day: buyers and sellers. One family I'm working with, they've never dreamt of moving into Vancouver West. Vancouver West last year, I have a listing listed by someone else who got a $1.35 million offer last year. A Dunbar home, 50 by 133, $1.35 million just for knock down. They turned it down because at the time it had been listed in February by another agent for $1.598. And now, I'm listing it for $898,000. The highest offer we've had was $862,000. So, imagine. Last year, $500,000 difference. Nobody would think about moving into Vancouver West, now they could. They could sell their place a lot lower, say 10-15-20 per cent. But 10-15-20 per cent of what they want to upgrade into is that much more. Q: So you need to see transactions, you need to see turnover before you can see any price stability? PH: It will come, it will come. Like I said, a lot of people all of a sudden realize. Six months ago, we weren't able to tell sellers.... they should come down. For example, one house I'm selling in Richmond, shortly after we listed in August, we had $598,000 and we had a $550,000 offer right away, which the seller turned down..... Of course last year, after that six months of really good, including July was really good, how do you convince a person they can come down from $598,000 to $550,000. By the time we actually wanted to accept it, the buyer said 'maybe we should have a subject to sale of their Vancouver East property,' and it just slid down. Finally we accepted a $450,000 offer, and it was totally willing and pushed by the seller, not by me. People are willing to take lower offers because they grab the money and go do something else. That's really a realization. I don't think sellers are admitting that they lost. The way I come across to sellers is that they've actually gained. PH: People are gaining. And most people in the market are moving up. Very few people are moving down. So, basically, when Richmond lost 10 per cent an average of $600,000, $60,000 or $120,000, 20 per cent. Vancouver West, $1.5 million, 20 per cent is $300,000. They just gained. So, nobody lost. Tsur Somerville: My sense is they haven't stabilized yet. They have further to fall. Michael is absolutely right, when you look at the resurge, you need to get change in sales before you get change in prices. Sales always lead prices. We saw in this market that sales started dropping before prices started dropping, and its going to in a way, work the same process. I think it's a little hard to figure out right now what's going on, because you had, October to December, abject fear in the developed world about everything. And anyone in that kind of climate is not going to go out and make a major investment. And from Dec. 20 to Jan. 15, you couldn't actually drive your car on any side street anywhere in the Lower Mainland, so there weren't going to be any sales either. So clearly, right now, everything I hear is that things are up from where they were, but figuring out what part of that is just a recovery and what part is a real change in direction is going to be hard until we can compare sales numbers now with where they were in the summer. We have this 50-per-cent drop, and are we recovered from that. At least the early indications suggest if there is a decline, the decline has slowed dramatically and sales are much closer to having sort of bottomed out, but that's not the same as turning around. MA: Could I just mention that another indication of a direction of the public interest is that our sales offices have been very busy over the last two or three weeks. I think we had about 500 parties through our sales offices last week, and that is.... and it is resulting in deals. But those people are, quite rightly, taking time to shop and compare in terms of what's available in the market. But certainly it is resulting in increased sales for us, substantially increase. And whether the trend will continue, I don't know. But it's happening right now. Of course I have no difficulty in advising close friends and family to buy a home now with interest rates down at levels that I would never have thought believable and with the price corrections that have happened in the market. So I strongly believe that if someone is to buy a home, in five years from now it's going to look like a very smart decision. If they're not prepared to live in that condo or single family home for five years, then they should not be buying, that's what I tell them. But there's a group of people who somehow try to somehow outsmart the market with their own home. They sort of want to play the market and buy on the bottom and the sell on the top. So you can't convince them because they will take their time and will probably be buying when the market's already started to heat up again, whenever that happens. The other thing, I don't know about you Patsy, but we're finding now there's a lot of first time buyers coming to our homes, and of course we love them because they don't have a home to sell. They're renting, and in many cases, they can now buy something for a monthly payment comparable to their rent if not lower. Q: Patsy, are people easily getting pre-approved? That is one of the concerns being raised about whether in fact credit is moving, banks are lending, so what do you see on the ground? PH: I actually deal with quite a few second-generation buyers as first time buyers now. And because of their job stability, ..... Banks only look at how long they have been working, not how long they will be working. Because nobody can tell that. I actually really haven't... it might be the type of clientele I'm dealing with is not risky, or their not (?) they're from Mainland China. Q: So they're getting pre-approved? Banks, a little bit more cautious about schemes like that. MA: We're finding that people who have employment have no trouble getting mortgages from banks and credit unions. We're very fortunate in Vancouver, because I don't think that is the case in the United States. But here there seems to be no difficulty in getting qualified people approved for quite large-ratio mortgages. TS: Part of what's being missed is the element of the market that was a big piece of the froth and is now not able to participate. When you're looking on the investment side, from what I hear and what I've been told, the banks are much stricter on providing funds for people who are not going to be owner occupiers. So there's a piece that was an important piece of driving the market in the aggregate, not for individual projects and I doubt particularly for your projects they were as much of a piece versus some of the high rise towers, and that's a market where the financing is really hard to get. The investment side is completely dried up. And then borrowers who say, two years ago or even a year ago, might have been able to get high LTD loans thought they didn't have great credit scores, those people are frozen out of LTD numbers. It's not that credit that has completely disappeared, but there is a slice of buyers who are not able to access the market in the way they once did, which can have an effect in the aggregate. Q: You talked a lot about confidence you will see higher volumes of sales in the spring, what do you see as the key factor that will bring buyers back? MA: I think you can only freeze the market, as I mentioned before, for so long. And then there is a need for people to secure accommodation and also, lets face it, people who have participated in the market over time have done very well. They have found, undoubtedly, their home has been their best investment. When you compare it to equities or other alternative investments, a home — whether it's a condo or a single family home — in Greater Vancouver has been a real winner. TS: Down 15 per cent is bad, but it's a lot better than down 40 or 50 per cent. PH: I use that a lot when I'm closing. TS: If you invest in a GIC it's different, but nobody does that. PH: Nobody wants to lose, but if you bring them to a picture that they're actually winning, they will act on it. TS: People do that. We did some research on what people's reference point was for deciding on losses. And the reference point doesn't necessarily turn out to be the price they purchased, but what was the maximum they could have made, which at some level doesn't make any sense at all. But there's that psychology out there, and I think it shows up particularly when you get these turning points. And then after a while, that's in the past and people are less focused on what I should have done two years ago as opposed to what I should have done three months ago. MA: People like me, you see, who have been around for quite a long time in Greater Vancouver have experienced incredible appreciation. So I can tell people that I own a house in West Vancouver that has appreciated 17 times since I originally bought it. So if I've had that experience, no wonder I'm going to advise a lot of young people to get into home ownership position. That's many people's experience. Q: What's the likelihood of that being repeated? MA: Oh, I believe in the future of British Columbia and most particularly Vancouver, very much so. I mean, that's why in recent years our market has appreciated as much because we have attracted a lot of people to our shores. That has driven the price of housing to the quite high levels. We're the most expensive or second most expensive city in Canada, I'm not sure. (Most) We're still a lot cheaper though than other important international cities. The other thing that has occurred is that many people have bought residences in Vancouver just like we would buy summer cottages. They live abroad but they want to have a pied a terre in Vancouver. They may come here and only stay for a week or two a year, but they do it because they'd rather stay there than a hotel room, and also because they recognize it as a good investment for them. That is certainly added to the cost of housing. TS: Since we don't actually 100 per cent know which unit is which. But if you take the Lower Mainland and [calculate] 2.5 million people, 2.6 people per household, that's 800,000 households, 60 per cent homeownership [so] 480,000 households. The investment piece is still very small in the overall number. It's highly concentrated in certain product types, downtown condos, certain suburban high rise buildings. Overall, it's not a big story. Going forward, we have two things we don't really understand, which is what are those people going to do? "[i.e.] I own five condos around the world. Well, I don't necessarily keep them all, and people will buy and sell them depending on what city is attractive or not attractive, or what city they want to be in. So we don't really understand, I don't think we really know what's going to happen to those condos over time. A lot of local investors bought condos and some of those people are going to be squeezed, and we don't know what's going to happen with them. You've got people with pre-sales that are under water. In segments of the market there are still a lot of questions. What is the case, because of land constraints here, there are product types — single-family housing — where it's awfully hard to build new ones. MA: There are different types of investors. There are people who you might call them investors but who only occupy the home part of the year. It's not their principal residence. There are other people who buy condominiums to rent on a long term basis, which is wonderful because it's creating rental housing. And then there are those who buy to flip the paper. Those people don't buy from our company because we don't allow flipping. We don't see those type of investors. But I think those are more the froth, so to speak. They will get hurt in a market correction. But someone who buys to provide rental housing and as a long-term investment, they're going to be around. Q: Patsy, what do you see on the ground in terms of buying for occupation or investment? PH: All these years, I've never dealt with flippers. Never. If they wanted information, I've told them to go line up for themselves. I don't believe in it. I always advise my clients, own your own home. And young people, every two-three years, save enough money and put it towards your home. And when you get to your forties you should have it pretty much paid off, and you have your extra money, you have 50 per cent or so to buy another little condo somewhere. Rent it out, don't sell it, never sell anything: that is really the essence of real estate investment. That's the way I've always dealt. And every time [these things happened] we said "the end of the investment market, the end of the investment market." We kept saying that [but] it just kept going up, because we still getting foreign people from Russia, east Europe — I've got a Turkish big investor [who] in the last few years has bought a lot of things in Richmond — shopping centres and stuff. Right now, big time, Mainland Chinese — remember how Mainland people in China, half of them want to be in Canada. To make a long story short, basically, this is a baby as far as an international city is concerned. It sounds totally unaffordable for Canadian people, which was the same thing when I first went into the market when I was 23 here. I'd go "I can't afford this." But I rented downstairs out, I rented free rooms out, I had three jobs and etcetera. And looking back, I never regretted one moment of my decision to buy a home on Government Road [in Burnaby], Bob Rennie's neighbour. Basically, what I'm saying is, it doesn't matter how difficult it seems. Immigrant[s]. I was a new immigrant in 1973. I'd only landed for 2 1/2 years. I ended up with my own 8,000-square-foot lot, six-year-old home, two-piece ensuite, gleaming hard wood floors. That's immigrants' dreams. As long as we keep getting immigrants into Canada, and the wealth keeps coming in, and the talent keeps coming in,.... This is heaven on earth. They will pay anything for it. Q: Tsur, what's the expectations around the Olympics? TS: I think anything that's good about the Olympics, in terms of the economy, has happened already. The Winter Olympics are two weeks, it's not very long. It's the Winter Olympics, which are much more focussed towards Western Europe and North America, the skier who doesn't know about Whistler already is going to be relatively limited. I think what the Olympics has brought us is a certain kind of infrastructure that we might not have gotten already. The convention centre, a gateway project, the RAV line I suppose a little bit. That's where long-term benefits are going to be. Q: You don't see any impact on the housing market from eyes of the world [being on Vancouver]? TS: First of all, whether or not there is a positive economic benefit from the Olympics is not clear to begin with. That's globally. I think what Patsy's talking about about immigrants is really important in that part of what gives Vancouver, in a long run, a certain amount of strength is that Canada's an attractive destination to come to, there are a limited number of places that people are going to go in Canada and that's a certain growth in households. So you add that with the thing Michael talked about in terms of the natural churning that you get with households forming, divorce, death. You've got this basic growth. Compare that with some other places that have much more volatile household numbers and lower levels of immigration, in percentage terms, and it's something that means that even if we have a downturn, there is a base to help us grow out of it more quickly than might be the case otherwise. So when you talk about overbuilding, you think we have too many condos, on the other hand, you've got a period of time in which that surplus would be absorbed that's much shorter time period than might be the case in places that don't have that level of immigrant-driven growth. MA: I think one of the interesting things about this market correction is that there has been relatively little overbuilding compared to other corrections I remember, such as what occurred in the early 1980s and the late 1990s. This time, the banks have insisted on pre-sales and as a consequence, right now we have a very low inventory of completed, unsold condominiums. I think it's only about one month's absorption, that is very low. TS: [But] it's rising rapidly. MA: For single-family, it's about 4 1/2 months. I remember in the late 1990s, we were up to around 12 — 14 months. So, that's a good indication that the supply of unsold homes is going to be rather limited. Of course people are now stopping building. Housing starts are down about 50 per cent from a year ago, and I think quite a few of my colleagues will take a bit of a holiday from building until the market strengthens again. TS: The only thing I would caution on that is that when you look at the relationship between starts and household growth, our starts numbers are way above household growth. And that's the trying to figure out the investment and second-home share of the market, and really understanding what goes on with them. So there isn't classic overbuilding in a Miami sense where there's a condominium with nobody owning any the units or only owning 25 per cent of the units. You don't have that kind of framework. But we do have a situation where we've built a lot more units than we've had growth in households. Some of that was clearing out sort of people who had delayed purchasing in the downturn that ran from 1994 to 2000. That is part of the story, but I just don't feel really comfortable in a market when you've got 50 per cent surplus of starts over household growth. MA: You're referring to traditional notions of relationship between starts and household formation and headship rates. They don't necessarily pertain anymore, because many people do like to own more than one home. That is not uncommon, and it is not only overseas people who do that. People who have their principal residence on the Sunshine Coast or wherever like to have a condo in town, and vice versa. TS: What's the one they're going to sell first when they get into trouble? MA: I'm not so concerned about that. I don't think it's going to be the one in town. Q: Is there anything governments, the provincial government in particular, can do vis a vis making housing a little more affordable? Because there has been a whole issue of affordability, whether it's RBC's index or other measures. MA: Yes, the provincial government needs to help first-time buyers. We find even a couple with full-time jobs, in many cases haven't been able to save a down payment. So I think there's a role for the government. In the old days, going back a couple of decades, we had a provincial second mortgage program introduced by W.A.C. Bennett, which was very successful. We also had a home-purchase grant for first-time buyers. It was an incentive to help them get into their first home. Of course we had limits to ensure that they were modest homes, but I think that's a role, and I would recommend that really as a way right now to increase employment in the province, because you are going to be surprised at how low housing starts are going to be in the next few months. There's no quicker way of firing up an economy than getting the housing sector going, much quicker than getting public works going, and also I should say much more efficient, because it takes a relatively low amount of government funding to provide and incentive. MOst of the capital comes from the private sector. Q: Patsy, do you hear complaints about the property transfer tax? PH: Well, it would be nice if it [ the threshold for charging the PTT] were $800,000. I'm more into making sure first-time buyers don't get in over their head: don't get into a luxury home when you can't afford it. But I'm more into the government doing more incentives in providing tax benefit or tax relief or regulations for tenants, bad tenants for investment. It's not just homeowners we're dealing with, we should be really looking into helping people, local people invest right back in here. PH: In rental property … rents have come down, by the way, a two-bedroom in Richmond, 800 sq-ft is $1,530. I just leased one … That came down from $1,800. I leased out a 15th floor for $1,530. Six months ago, when it was brand new, they leased out for $1,800. Same place, lower floor. So rents have come down, but interest rates have also come down, thank goodness. Q: Is there any one thing that you would suggest the government do in terms of affordability? TS: The problem you run into is that there are a variety of objectives you're trying to achieve with a limited amount of funds. I think the easiest thing to do on affordability is get rid of the property transfer tax for first-time buyers. The reason that makes it so onerous, is that you're not borrowing money to finance it, it's coming out of your equity resources. So your cost of capital for that particular piece is really high. And getting rid of it for first-time buyers would not be a major hit on the provincial treasury. But that's a short-term, one-time fix. If you want to think about, given the geographic constraints that we have — take that as a given — how do we move forward? Doing things to streamline the regulatory process to make it easier to do certain types of development are going to have long-run effects. But that's not a quick solution, you can't just snap your fingers and do that. Q: So, you mean all the kind of permitting process, all of the time it takes? TS: Doing things to streamline that process, accelerate that process, remove the uncertainty. The clearer it's going to be for developers, the less of their own equity they're going to have to put up to go through that process, the quicker that process happens … It doesn't mean you get rid of regulations, but streamlining that process and rationalizing it is something that will have a long-term benefit. On the other hand, if you ask yourself what's the social need, poor renters are in a much tougher shape than somebody who can rent a condo but can't get the first-time house of their choice. One of the things you run into, it's not that people can't buy a house, they can't buy a house they want in the location that they want. That's a preference issue, but it's not a horrible social policy issue. On the other hand, we have poor renters who are in really difficult straits when you think of their ability to live reasonably close to work and have a reasonable percentage of their income going to housing. Given the land prices we have in this city, probably a more aggressive social housing policy is really going to be important. If you look at other really land-constrained environments, [such as] Honk Kong and Singapore, they have very aggressive social housing programs, extremely aggressive social housing programs. And that's because I think poor renters are ... the burden on them for affordability is really much greater than it is for the person who … "yeah, we waited and bought a house in the neighbourhood we wanted to buy. It's not that we couldn't have bought real estate someplace, we just had preferences." And it's not clear to me that the number of people who are truly priced out of the market as opposed to being delayed for two years or instead of being a condo downtown Vancouver end up in Burnaby, that doesn't strike me as the acute issue. PH: He mentioned Hong Kong and Singapore … They were very, very successful only because they were resettlement areas, not right downtown. The people that are really rich don't want to live with a whole bunch of … excuse me for saying, I'm not being … Anybody who wants to pay $800,000 doesn't want to live with somebody who's getting the same deal, same counters and everything and pays $400,000, right? So I think that's really the failure or the success. It depends on what angle you look at Vancouver. TS: If you sold the social housing in the Olympic village you could buy a lot more housing for more people somewhere else. PH: That's the commentary. Chinese radio was talking about that. You could use that money and put beautiful places in, (I shouldn't use the word Surrey, people always get) in other neighbourhoods. MA: I'd just like to point out that most people in the homebuilding industry here do consider that housing is too expensive in Greater Vancouver. And one of the benefits, perhaps, of this correction is that prices are coming down. Also, the costs of new construction will come down. Construction costs are coming down, our finance costs — the interest we pay the banks is coming down — and also land prices will eventually come down a bit. But one thing isn't coming down, and that is the imposts we pay to municipalities. For instance, in Richmond we're building wood-frame apartments for young people, first-time buyers. We're paying over $28,000 per unit to the City of Richmond. In South Surrey, we're paying over $25,000 per unit to the city for development-cost charges again for homes we're trying to sell to first-time buyers. This is really counter to the whole idea of making housing more affordable. So that is a real problem. Q: Michael, on development cost charges and so on, are you concerned this is becoming more than cost recovery for the services they have to install, or are you saying they've become a profit centre? MA: I do feel often that … First the municipality tells us we should pay all the costs of development so they don't impact the taxpayers already resident there. Then, of course, we're paying now for community centres, fire halls, this and that: normally services that would be provided for all residents of the community. And it's a very different way of financing service extensions. In the old days it was different. We didn't have development cost charges, and the municipality took the responsibility for the extension of sewers and road building and that sort of thing, and would charge it back to new owners over time. They would float some bonds or something of that nature, and it would be charged back over time. Here, they think 'we'll stick the developers, because we don't have a vote.' Of course all we do is try to pass it on to the buyers. So it does make for a very high cost structure and just adds to the unaffordability of housing in Greater Vancouver. PH: And it gets passed down to the homeowners. But you're lucky you're actually paying. In Richmond now, there's a piece of land on No. 4 road, a small one, 1.75 acres, one-third of it has to be ... not payment, but on this piece of property you have to build affordable homes to, maybe seniors housing [or] whatever. You have to physically build it, non profit. It is a must. Now you can only develop 1.1, 1.2 acres, and you have to carry this non-profit thing with you. That is just.... 'what are we doing.' We do a lot of charity, but I think it's up to us to do it the way we want to do it with our money rather than you grab our money up front and force us to do something. That's what is happening in a lot of municipalities now. Because we all have to look good, we all have to be great humanitarian people. That's really what it is. And I think that is a big factor. MA: I know a little bit about it. PH: That's really what it is. We have to now, if you have a piece of land, you have to provide affordable something for somebody to do so. So that's a stumbling block. The Vancouver Sun Saturday, July 19, 2008. VANCOUVER, B.C. – RE/MAX realtors Sandy So and Patsy Hui are not only in the business of selling homes. They're also in the business of raising money - for BC Children's Hospital. So and Hui have been involved with the hospital's fundraising efforts for more than 10 years, and this year are working to raise $1 million for the hospital's Campaign for BC Children. So and Hui have put aside $500,000 and will match up to 50 donations of $10,000 to the campaign. Last month, they reached out to fellow realtors to donate to the cause and are now extending the match challenge to the public in order to make sure that they each donate their full goal of $250,000. The Campaign for BC Children is working towards the construction of a new children's hospital and is focused on raising $200 million through public donations. For more information, contact philanthropy officer Marcie Mark at 604-875-2857 or mmark@bcchf.ca. 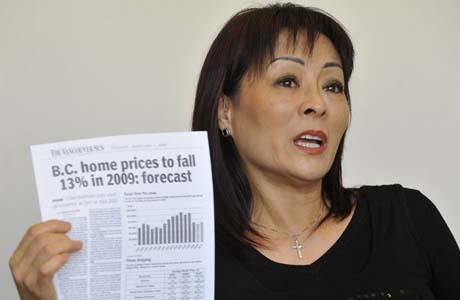 Translated from Chinese Experienced agent, Patsy Hui, points out "Vancouver's property prices are 'dirt cheap' compared to other international cities of the world. Vancouver not only attracts new immigrants purchasing their new homes, but world-class investors. Supply still does not meet demand. Real estate prices have been continually rising for more than 5 years, while interest rates are at an all time low. People who are afraid of "missing the boat" will soon seize the opportunity to buy at the right moment. She predicts this year's real estate market will continue to rise steadily." Patsy continues to say, "While Richmond, Vancouver West, and Vancouver East property prices are relatively high, these three areas still attract a lot of buyers. The abundance of shopping centres, transportation infrastructure, and many restaurants explain it." Real Estate Board of Greater Vancouver's president, Rick Valouche, presents Patsy Hui her Life Member Medallion Award for her 23 years of service. MLS Annual Awards Gala; Spring 2007. Patsy recently received an honour recognizing her lifetime work in real estate, specifically celebrating her 21 years as an Medallion Club achiever. At the spring awards gala, MLS president, Rick Valouche, presented Patsy with her Life Member Medallion Award. Successful in over 23 years in real estate, Patsy looks to the future with continued enthusiasm. "Smart work and passion for the business keep me going. It's hard to believe sometimes it's been over 23 years. I still feel just as excited for my clients as I did when I began!" In addition to this year's special recognition, Patsy has 13 times won a President's Club award (top one percent of the real estate board's top-producing members). Each year, the Real Estate Board of Greater Vancouver celebrates the distinguished achievements of its top-producing members with the Medallion and President's Club Awards. These awards honour outstanding contributions, dedication and success in the real estate industry. The Real Estate Board of Greater Vancouver (REBGV) membership is composed of over 8,900 REALTORS. The 2006 Medallion Club qualifiers are selected from the top 10 percent of REBGV's top-producing members for the year. The 2003 Realtors Care Awards for community service were given to L-R: Elaine Andrews (North/West Vancouver), Patsy Hui (Richmond/South Delta), Artur de Andrade (Vancouver East), Barry Willimott (Burnaby/New Westminster/Tri-Cities), and Sherree Mitchell (Vancouver Westside). VANCOUVER, B.C. – The Real Estate Board of Greater Vancouver is thrilled to announce the 2003 Realtors Care award winners. Congratulation to; Barry Willimott, Patsy Hui, Artur de Andrade, Sherree Mitchell and Elaine Andrews. The Realtors Care award celebrates realtors with a dedication to community service. It is recognition for those who give back to the neighbourhoods where they work and live through fundraising or other volunteer activities. The sincerity and compassion behind the efforts of all nominees reinforces a positive image of realtors and raises the profiles of many worthy causes. For more information please visit the Realtors Care Web site at www.RealtorsCare.org. Patsy donates her time and money to B.C.’s Children’s Hospital, S.U.C.C.E.S.S (The United Chinese Community Enrichment Services Society) and many others [find out more HERE]. When it comes to giving, realtors are among Greater Vancouver’s most generous donors. A variety of charities and outreach groups across the Lower Mainland benefit from their gifts of time, energy and dollars. Realtors care about their communities. From division golf tournaments and holiday parties to initiatives that span the entire board area, realtors donate their time and energy to charitable causes in various ways. You might see them coaching the little league team at the local community center or spending a free evening delivering food to the homebound. Sometimes they’re organizing charity golf tournaments or a gala evening that raises thousands of dollars. During 2003, more than $184,000 was raised by realtors for charities and local outreach groups throughout Greater Vancouver. This represents an increase of 21 per cent over 2002, when more than $152,000 was distributed to local charities. There are a number of regional fundraising efforts that occur throughout the year, as well as initiatives that incorporate realtors from across the Lower Mainland. The largest of these is the Realtors Care Blanket Drive. Realtors from the Real Estate Board of Greater Vancouver, in partnership with those from the Fraser Valley Real Estate Board, help many of our neediest residents every winter. This year saw the ninth incarnation of the event, which collected nearly 1,900 bags of blankets, coats, clothing and other necessities, the highest number of donations ever received. Items were distributed to shelters and agencies across the Lower Mainland including Union Gospel Mission, Salvation Army, Friends in Need Food Bank and SAGE House. This worthy endeavour is organized and run by realtors from each geographic region in the Lower Mainland. All donations collected stay in the local community. Realtors also support an ongoing association with Teldon International Inc. For each custom board calendar purchased, the Teldon program contributes 10 cents to a charity selected by the Realtors Care Task Force. In 2003, more than $5,500 was donated to Canuck Place. The Real Estate Board’s third annual Charity Golf Classic was another great success. This year, realtors raised more than $11,500 in support of The Children’s Wish Foundation of Canada. This foundation gives children suffering from high-risk or life-threatening illnesses the opportunity to experience the wish of a lifetime. In celebration of all the generous work done by realtors, the Real Estate Board of Greater Vancouver created the Realtors Care Awards. Each year, this community service recognition program recognizes the contributions realtors make, through fundraising or volunteer activities, to improve the economic and social well-being of our communities. Awards are given out in each geographical area and help bring awareness to the many valuable causes supported by realtors. Tuesday, February 24, 2004: F4. Reproduced here with the express permission of The Vancouver Sun. Last year was an excellent year for the Vancouver housing market as interest rates fell to 40-year lows. Inflation remains low and the Bank of Canada is likely to reduce its trend-setting rate yet again later this month, possibly by as much as 50 basis points. Will the housing market remain strong? To find out, Vancouver Sun Westcoast Homes reporter Rod Nutt asked a number of top Vancouver realtors and developers to predict how the housing market will fair and what the major trends will be in 2002. "Just like magic, we are running out of good listings everywhere. The Sept. 11 disaster dented the Lower Mainland real estate market for a short while but then the 40-year interest rate lows fueled the first-time buyer's and upgrader's market and it went wild. You can't blame the buyers for rushing in. Why? Supply is low; price is still reasonable; not much of a good return in the stock market; hardly any interest earned having money sitting in the bank; and mortgage rates are so low that it's cheaper to own a home than rent. The 2002 market trend? Definitely up, up and away!" Saturday, January 5, 2002: D1-2. Bill Gates and Richmond realtor Patsy Hui pause for a picture at the Annual Children's Circle of Care Gala Dinner held this year in Redmond, Washington. "Giving back to the community isn't a question, it's a pleasure." For Patsy Hui, simply living in her community of Richmond for the past 28 years has not been good enough; contributing to that community has and continues to be of utmost importance for the local realtor. As the year winds down, she reflects back on the work that she has done and what she looks forward to in the coming year. "I find myself involved in a variety of different organizations and events. Sometimes it's been an on-going relationship - lasting many years - and other times, it's a cause that fuels me to join in. When I hear of something I know I can contribute to positively, I can't help but to want to. I am busy, but I make the time to help." 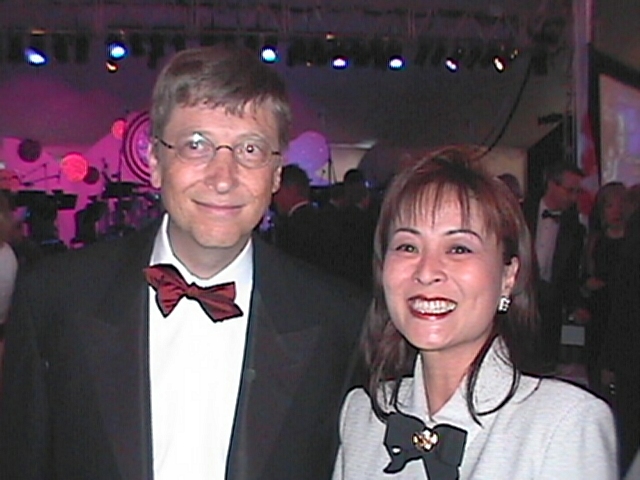 In May, Patsy met with Bill Gates in Redmond, Washington at the Annual Children's Circle of Care Dinner. Gates was the host this year and congratulated Patsy and others on funding "one of the finest children's hospitals in the world". Patsy chaired the B.C. 's Children's Hospital Chinese Canadian Community Telethon & Radiothon for 1995, 1996 and 1997, which raised over a million dollars for the hospital. She continues as an active committee member chairing the annual Dance for Kids at the Crystal Ballroom and finding it very rewarding to raise funds for B.C. 's sick children. A strong proponent of cultural education, Patsy has been the long-time director of Lorita Leung Dance Association, which objectives are to preserve, promote and enhance Chinese dance. Its studios are based in Richmond on No.5 Road. Fundraising for the United Way in October, Patsy vice-chaired "Sounds from Ancient China", a charity concert at UBC's Chan Centre featuring Chinese Virtuosos from the Chuen Ying Arts Centre. She has also been a long-time diamond sponsor for the Richmond Chinese Community Society. "I've always believed in a harmony between east and west cultures." "My community has been very kind to me. It's the least I can do to give back as much as I can by getting involved." 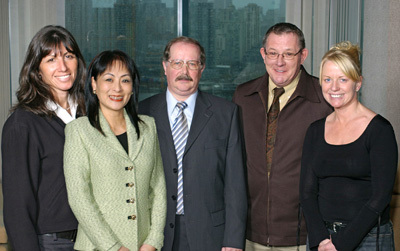 Ian Smith, Vancouver Sun / The Vancouver region's top realtors over the past 10 years include, left to right, Manyee Lui, Grace Kwok and Patsy Hui. They came to Canada at the same time and all left banking positions to enter the competitive world of real estate sales. Do your best, is their advice to others. 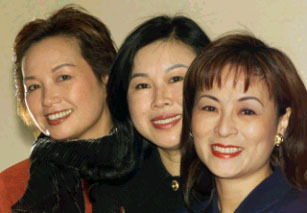 Grace Kwok, Manyee Lui and Patsy Hui all came to Vancouver from Hong Kong at about the same time, they are about the same age and they are all bank employees-turned-realtors. Now, they are consistently among the top-ranking realtors in the Vancouver area. Although they didn't know each other when they came, they are good friends, having attended each other's weddings and having learned a thing or two from each other. They have a passion for making money and they are damn good at it. The reigning queens of real estate, jewels in the city's Asian crown, these women turn million-dollar deals without breaking a sweat. Throughout lunch with the trio, lipstick is carefully corrected between courses and cell phones trill incessantly like electronic birds. Even when they aren't ringing, graceful hands reach for them to see who might have called. They exude a quiet poise that can be unsettling at first, exchanging the names of friends and acquaintances who are part of an Oriental family compact known only to insiders. They're a bit of a mystery, these three. But they are ever-polite, beautiful at 50 and discreet, too. Ah, yes, discreet. That's the word. It may be the clue to why these low-key players are such high rollers. Businessmen, take note. Not for them the flamboyance of the cocktail circuit, the hobnobbery of the brash, although I'm told Kwok knows how to throw a party. Their success is based on quietly building connections, reliability, on learning from each other and a bit of luck, too. Their careers crested on an Asian tide that washed up on Vancouver's shores, bringing a boom in real estate. In the mid-1990s, million-dollar homes were being snapped up like rice cakes by Asian immigrants, mostly Chinese from Hong Kong. And here they were, these lovely ladies, with the smarts to cash in. They made a couple of trips a year to Hong Kong and Taiwan to maintain contacts with bankers, lawyer and immigration consultants. At one time, Kwok maintained an office in Hong Kong. In some ways, they are as different as they are alike. Kwok is the organizer and the ringleader. Lui is the quiet, enigmatic type, the picture of mature elegance, and Hui is so effervescent she is like a champagne bottle waiting to pop. One by one, they fell like kingpins into the profession. Kwok was first, starting work in real estate in 1980 with her partner husband. She had this friend Lui, whom she met years ago at Simon Fraser University, where the two arrived in 1968 as 18-year-old foreign students, studying math, commerce and economics. When both women were roughly in the toddler-raising stage, Kwok popped the question to Lui: Why don't you get into real estate? After all, it afforded flexible hours, ideal for the young mother. Yeah, right. In 1983, Lui followed suit, first working part-time, then working herself up to 75-hour work weeks. Then along came Hui, who arrived in Canada in 1970, at age 19. After working for the Royal Bank, she, too, made the switch. As she tells it, she was natural-born entrepreneur. "I'm a duplicate of my father. He was a super salesman in Hong Kong. It's in the blood." Is it ever. At age 23, she bought her first home in Burnaby and rented out the basement suite to students. Ironically, that's how she met the doctor who became her husband. The three broke the bonds of Chinese tradition. "For Chinese women, it was unusual," said Kwok. "There was very traditional thinking. Women should go out and work, but it should be in a safe environment, like a bank. You shouldn't be meeting strangers." They are now the darlings of the Chinese business world. 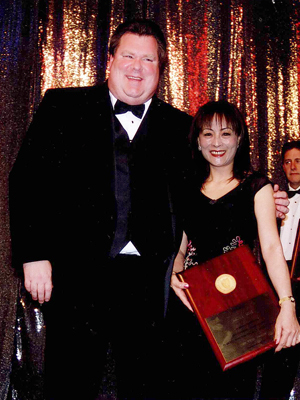 Kwok was chosen outstanding citizen of the year 2000 by the Vancouver Chinatown Lions' Club and Hui has chaired the Children's Hospital Chinese telethon. Each one has carved her own niche. Kwok is the condo queen, selling hundreds of them in downtown high rises. Lui presides over the west side, selling toney million-dollar homes in places like Shaughnessy and Point Grey. And Hui is based primarily in Richmond, concentrating on residential resale and commercial and industrial strata units. Through all of this, with the exception of Kwok, who says she has no hobbies and doesn't want or need any, they share the Chinese passion for ballroom dancing, good food, skiing and travel. They claim there are no secrets to their success. They trickle out as subtly and succulently as the delicately flavoured lunchtime fare. The same Chinese values that made them renegades equipped them with the values that made them successful. Honesty, sincerity, hard work. Unlike the aspiring superwoman, these three don't pretend to wash their own floors or to have the foggiest idea how to whip up a souffle, although they could probably tell you in a jiffy who could. Their credo: let everyone do what they do best. They are efficient with their time, using fax machines, the Internet and the omnipresent cell phone to their ultimate advantage. Kwok doesn't drive. She takes cabs and meets clients on location; she claims it saves her all kinds of time. They have learned to read clients like a book, to close each sale like a chapter, moving quickly onto the next, to walk that fine line between being aggressive and pushy. Near the end of the lunch, the last of the secrets trickling out with the dessert, Hui grabs my notebook and writes something in Chinese lettering. What does it mean? Destiny and fate. Just do your best, they say, and things will fall into place. Thursday, February 1, 2001: B1-2.